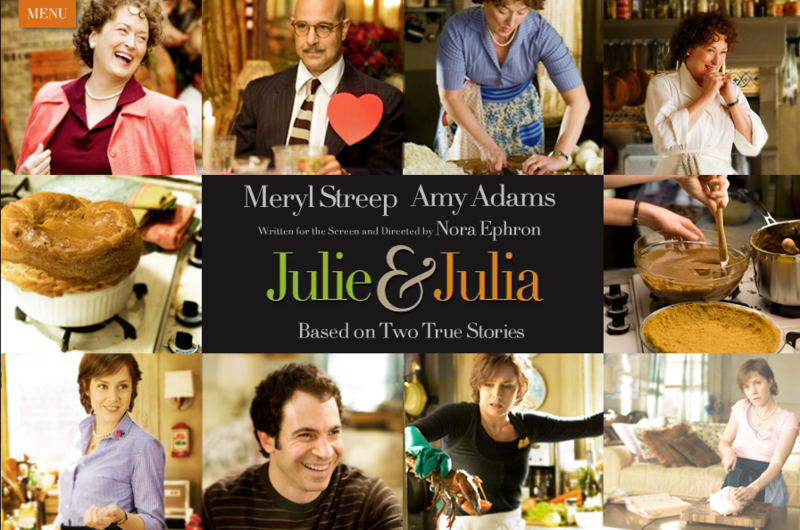 Posted on August 9, 2009 by Elizabeth E.
Last night Dave and I went to see the movie Julie and Julia. I’d read all the pre-event publicity–the interview in the NYTimes with Nora Ephron and the reporter making an apple tart, press about the food stylists, press about the preparation of the food, director’s musings (that would be Nora Ephron again), analysis by Julia Child’s friends and relatives–and I was ready. Oh, they said, and started asking others if they wanted free tickets. Okay, I should have known that the oldies station wouldn’t gear up for a movie about cooking. I noticed that the audience in our movie was trending toward Social Security recipients, but we found our seats, and endured the endless previews (We found one we won’t be seeing: “Stepfather,” about a guy who’s trying to marry into a family with children and turns out to be a murderer. Great.). 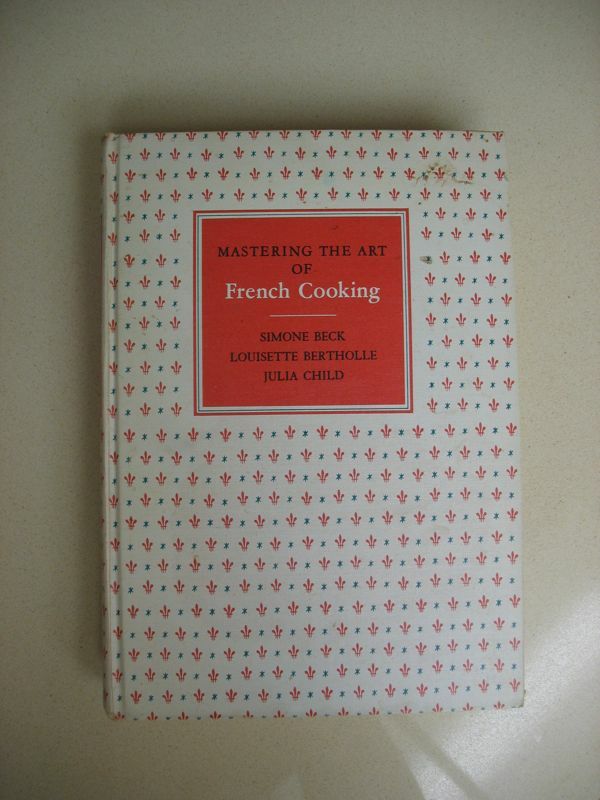 I went home and thought about buying Mastering the Art of French Cooking, you know, just to have the book. Actually the scene with the chocolate cake was a real motivator. The copies I saw on Amazon were running in the fifty-buck-and-up range for a vintage book. So, we’re eating dinner tonight and I idly look over at the bookcase. There between The Naked Chef and Fannie Farmer is. . . yes! 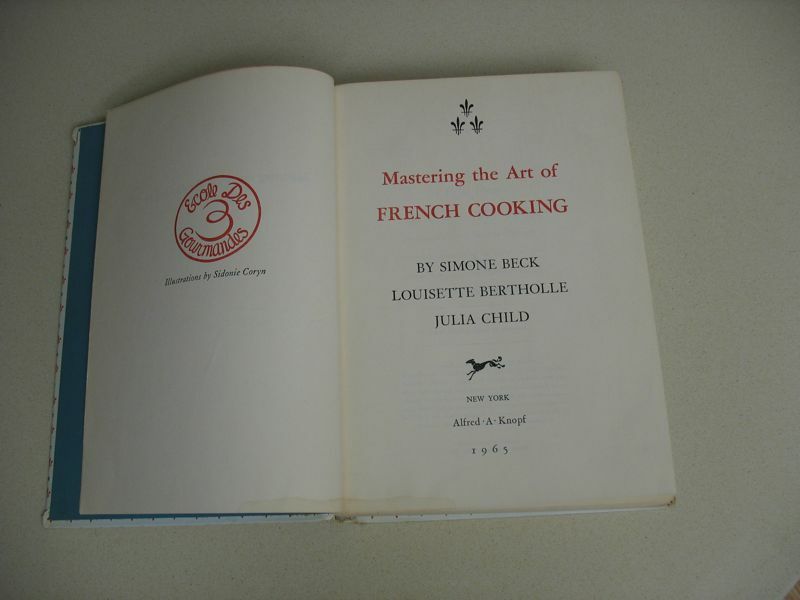 Mastering the Art of French Cooking. I recognized the cover as being similar to the one shown in the movie last night. Can’t believe it. It’s got some food stains on the front, and when I opened the cover, neatly penciled in the corner is the price: $8.00. It’s a first edition, 10th printing in August of 1965. I must have purchased it at an estate sale here in Riverside. I wonder if I bought it at Norma Baricelli’s sale; she was a neighbor who also taught me at RCC. 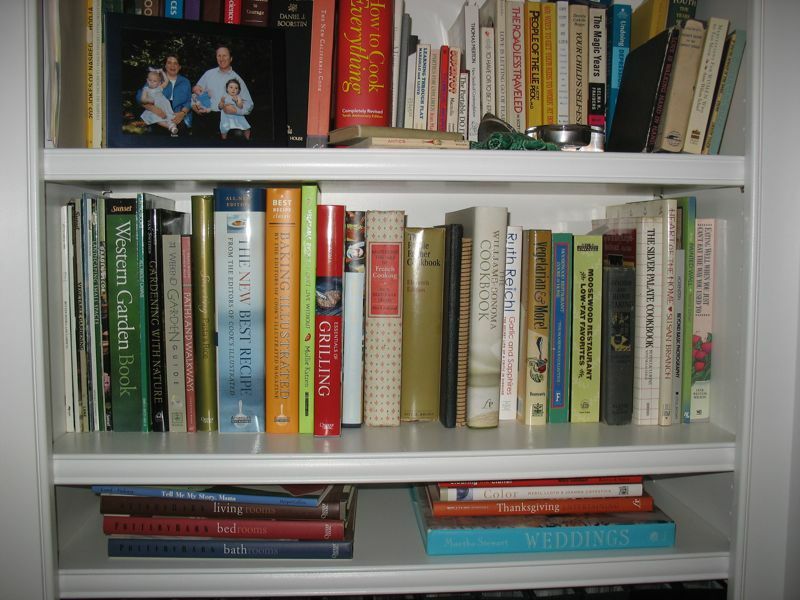 I have no idea really, but I did pick up quite a few cookbooks at that sale. So now I check Amazon since I have more specific details, in order to find out the worth of this book. I like that it has the same printed cover as the one in the movie, and see the little “Ecole des 3 Gourmands” logo facing the title page. I wonder if it’s worth that 50 bucks that I’d seen before.